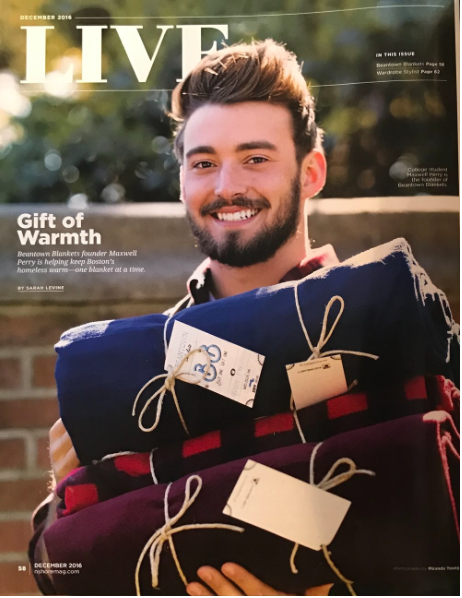 Since the start of 2016, Maxwell Perry ‘15 has donated more than 800 weatherproofed blankets to Boston area homeless shelters through his one for one non-profit organization Beantown Blankets. Partnering with the Pine Street Inn, they are ensuring that for every blanket bought, one is given to someone who needs it. Beantown Blankets was born out of a Babson College class project, but Perry credits St. John’s Prep with giving him the foundations to make it all possible. “St. John’s encouraged innovation,” Perry says. And he smiles, “but not in a way that made you afraid to fail.” He’s wistful when he describes how much that stayed with him – how the Prep’s encouragement to simply try things made all of his work with Beantown Blankets possible. It all started with an entrepreneurship program during his junior year at the Prep. Modeled after Babson's Foundations of Management and Entrepreneurship course that all first year students take, the program invigorated a deep passion for creation and entrepreneurship within Perry. From that point on, he set his sights on Babson College and ensuring that his application would stand out among his peers. He co-founded the Future Entrepreneurs club with fellow 2015 graduate Kyle Schiff, where they invited guest speakers like former trustee and past parent Elliot Katzman to speak to the group. Future Entrepreneurs created a space for students to discuss ideas and projects and to compete with each other. It was through Future Entrepreneurs, and the conversations they had with advisor Tim Broderick ’05 and the speakers they heard, that Perry honed his belief that being truly successful is not about just about having a great career, but giving back as well. “I wouldn't be in this situation without going to St. John’s,” he says, looking around Babson’s Student Center on a dreary late November morning. He talks about the opportunities that he was presented with, the interests that he was able to cultivate, but what he says really impacted him the most at St. John’s was the people. Perry credits the faculty and staff, and the opportunities that they presented him with, for allowing him to uncover his passions. “I took Chinese with Ms. Chen,” he says, speaking about how a trip to Taiwan opened his eyes to an interest in Chinese. “It’s an up and coming market,” he explains. “And I knew it was something I wanted to cultivate. I think that set me apart” [in the Babson application process]. It’s what he wrote his college essay on and hopes to pursue in the future. It wasn't just the faculty and staff at St. John’s who had an impact on Perry, but his classmates as well. Perry is firm in his belief that the friends he made at St. John’s were crucial to his success. “They taught me humility and zeal and trust.” He says, referring to three of the five Xaverian values. Before starting college, Perry spent time working, reflecting and preparing. The entrepreneurship program through St. John’s had given him a window into what his first semester at Babson would be like. He would need to create a company as one of his first assignments, and so he began laying the groundwork for Beantown Blankets. He says he couldn't help but think about his senior year English teacher, Maryanne Muhilly. “She really instilled in me a lot about how I want to treat people.” Perry says her lessons weighed heavily on his mind as he looked for a business model that would be both successful and socially conscious. This fall, Perry re-launched Beantown Blankets on his own. He’s partnered with a manufacturer in Fall River and the blankets are available online at the Beantown Blankets website. Perry has big plans for 2017. He is hoping to expand into retail sales and reach a wider market. He’s also exploring a partnership with the NHL and NFL so that Beantown Blankets are sold in each of the team’s merchandise stores. He knows there’s so much potential. And so far, Perry has met every goal that he’s set. “I wanted to go to Babson,” he says. “And I’m here. I wanted Beantown Blankets to be featured in a publication.” They were profiled in Northshore Magazine this fall. He’s hoping to diversify his product in the new year, to open them up for a larger retail presence. Perry walks me out and I ask if he’s headed to library. He’s not. It’s almost noon and he’s done with classes for the day so he’s driving to his home in North Andover to fold blankets with his mother. They are preparing for a donation on Friday.